There is plausible biological evidence as well as epidemiologic evidence to suggest coffee consumption may lower endometrial cancer risk. 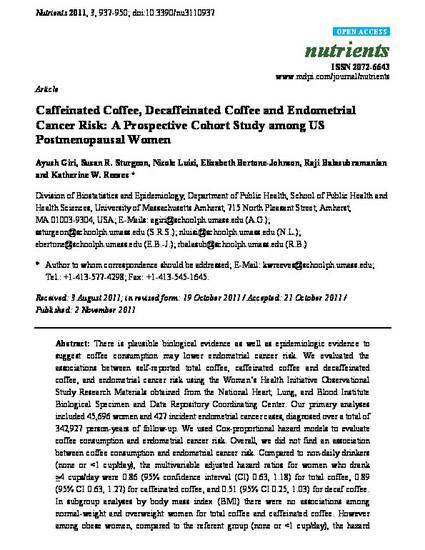 We evaluated the associations between self-reported total coffee, caffeinated coffee and decaffeinated coffee, and endometrial cancer risk using the Women’s Health Initiative Observational Study Research Materials obtained from the National Heart, Lung, and Blood Institute Biological Specimen and Data Repository Coordinating Center. Our primary analyses included 45,696 women and 427 incident endometrial cancer cases, diagnosed over a total of 342,927 person-years of follow-up. We used Cox-proportional hazard models to evaluate coffee consumption and endometrial cancer risk. Overall, we did not find an association between coffee consumption and endometrial cancer risk. Compared to non-daily drinkers (none or < 1 cup/day), the multivariable adjusted hazard ratios for women who drank ≥4 cups/day were 0.86 (95% confidence interval (CI) 0.63, 1.18) for total coffee, 0.89 (95% CI 0.63, 1.27) for caffeinated coffee, and 0.51 (95% CI 0.25, 1.03) for decaf coffee. In subgroup analyses by body mass index (BMI) there were no associations among normal-weight and overweight women for total coffee and caffeinated coffee. However among obese women, compared to the referent group (none or < 1 cup/day), the hazard ratios for women who drank ≥2 cups/day were: 0.72 (95% CI 0.50, 1.04) for total coffee and 0.66 (95% CI 0.45, 0.97) for caffeinated coffee. Hazard ratios for women who drank ≥2 cups/day for decaffeinated coffee drinkers were 0.67 (0.43–1.06), 0.93 (0.55–1.58) and 0.80 (0.49–1.30) for normal, overweight and obese women, respectively. Our study suggests that caffeinated coffee consumption may be associated with lower endometrial cancer risk among obese postmenopausal women, but the association with decaffeinated coffee remains unclear.